Program this cuddly doll to shine a red light to signal bedtime and green for "rise and shine!" It's a sheep! It's two sheep! No, it's Sleeper Hero, here to fend off scary dreams, comfort restless kids, and save the night. Developed by sisters Anna Richardson and Meggie Hunley after struggling with their own children waking in the night, this lovable plush and its accompanying bedtime tale—which follows a kid who finally finds his way to dreamland—are instant favorites in groggy homes. The soft, cuddly doll can be programmed to shine a red light to signal bedtime and a green light to say "rise and shine!" Made in China. Anna Richardson (Co-Creator and Author) and Meggie Hunley (Co-Creator and Illustrator) were first sisters before becoming business partners and Co-Creators of the SleeperHero book and doll. Anna was inspired to create the concept after struggling with transitioning her two older kids to their big kid beds. Her background in teaching Special Education played a role in introducing the doll to children with a storybook. She loved using books as a tool in her classroom and was confident a story could help her own kids with their predicament as well. She shared her idea with Meggie (a graphic designer) who immediately fell in love with the idea and the two set out to co-create the storybook and prototype. The sisters are consistently inspired by the overwhelmingly gracious responses they've received from happy customers. 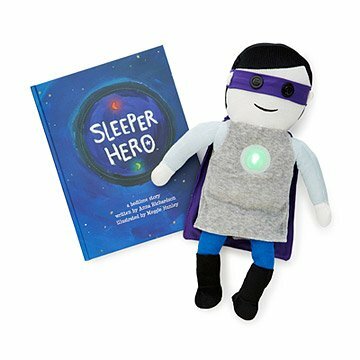 SleeperHero provides a fun solution to a universal problem, while also being a really unique and thoughtful gift for children and parents alike. When children learn to sleep better, everyone in the house sleeps better. Spot clean. Not machine washable. My Granddaughter loves Super Hero! Was great transition into big girl bed and recent addition of new brother! Has really helped my Son! My son loves the story that came with the sleep hero. He has slept with him every night since getting it!